When I posted my samples of St. Clair Scents on Instagram Stories, someone responded with “It’s Chef Keller’s butter lady’s perfumes!” with a heart emoji. I was completely confused by this. After doing a little more research, it made sense. The perfumer, Diane St. Clair is an owner of a homestead creamery that does supply Chef Thomas Keller (The French Laundry, etc.) as well as other well-known restaurants with butter.¹ Diane says that she approaches fragrance like she does her artisanal creamery. Everything is small batch and she’s inspired by the land. Notes listed include bergamot, yuzu, rosemary, basil, tomato leaf, lavender, rose de mai, rose geranium, immortelle, hay, tobacco, oakmoss and vanilla. First Cut opens with a freshness from citrus and aromatics. It’s like a lavender glazed in yuzu. It wears crisp and green, reminding me of grass. As it wears, it becomes drier and warmer. The green grass turns into hay. It’s not listed, but the fragrance starts to wear like honey/beeswax mixed with dried tobacco and hay. There’s also a delicate rose in this that doesn’t overwhelm. Essentially this is an aromatic fougère…and it’s a really good one. Notes listed include Meyer lemon, tomato leaf, galbanum, bergamot, jasmine sambac, apricot, black currant bud, linden blossom, lily, rose, leather, saffron, patchouli, amber, vetiver, benzoin, castoreum and fir needle. Gardener’s Glove is a tangy lemon with green vines. It starts to smell like a heady white floral. Underneath all of this is a buttery leather. To my surprise, there’s a fruity blackcurrant and green tomato leaf in Gardener’s Glove. Gardner’s Glove is one of those fragrances I forget I’m wearing and then hours later, I’m always like “What beautiful thing am I wearing? !” and then I remember. It wears as a fresh bouquet of flowers with a hint of stone fruits. But, what is so perfect with it is that buttery leather. Gardener’s Glove is my favorite from the trio. It has some of my favorite notes (tomato leaf, blackcurrant). It really smells like a well-worn gardener’s glove. It’s leather, flowers, vines and earth. Out of all the indie stuff I’ve tried this year, this has been one of my favorites (this and Providence Perfume Co. Vientiane). 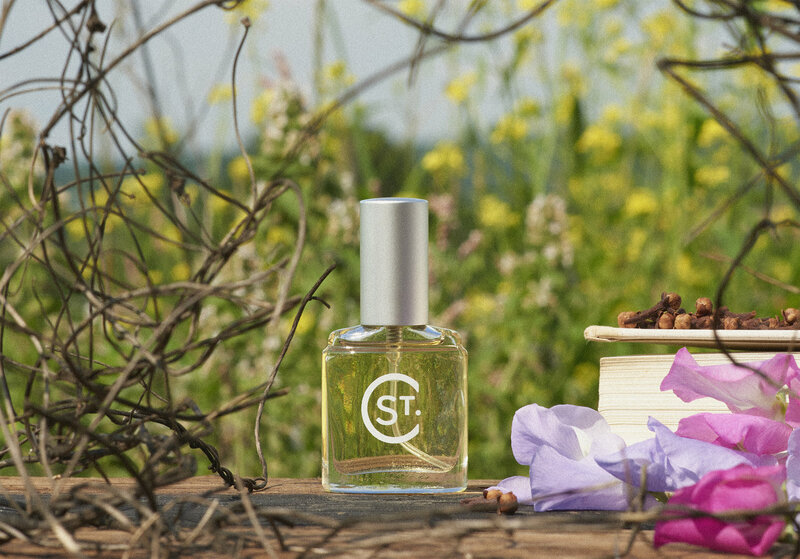 Notes include bergamot, mandarin, coriander, petigrain blossom, Meyer lemon, honeysuckle, rose geranium, elderflower, petitgrain, cistus, labdanum, vanilla, vetiver, cedar, smoke and clove. This perfume is inspired by the poet Robert Frost. However, Frost reminds me of the first frost of the year. Frost opens with a cool crispness cutting through a smoldering campfire. The coriander in this comes across as cool and metallic, reminding me of a fire poker. The heart is like roses and elderflower lemonade. it dries down to a smoldering amber. To summarize Frost, I’d say it’s like “cool smoke”. Projection and longevity for all of these are average. I don’t like to compare a new line to others, but it can be helpful so I will. Diane appears to already have a cohesive style. 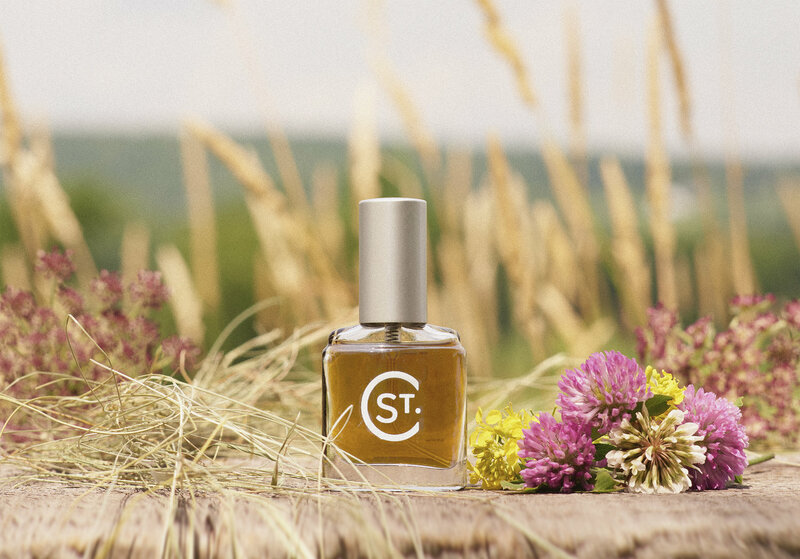 The perfumes feel “environmental” in that they remind me of a place and you can tell they are inspired by natural environments (in this case, rural New England). If I had to compare to other brands, I’d say to try this line if you like perfumes from Sonoma Scent Studio or Hiram Green. 13 ml (about .44 oz) bottles retails for $65 at St. Clair Scents. Samples are also available for purchase. ¹It’s called Animal Farm and it’s in Orwell, Vermont. I have complained about the quality of buttermilk since moving to the NYC metro area and can’t wait to go by Saxelby Cheesemonger’s and pick up some of Animal Farm’s non-watered-down buttermilk. *Disclaimer – Samples provided by the brand. I am not financially compensated for my reviews. My opinions are my own. I read about her farm! She apparently makes some very expensive butter!! Would love to try her buttermilk and make some biscuits with it. You’re right about most buttermilk out there. Thin pale stuff. I’ll have to try her perfumes. I love SSS and Garderner’s Glove sounds really good. Animal Farm in Orwell, Vermont is really very clever. I wonder if Frost was inspired by “Stopping by the Woods on a Snowy Evening” by Frost. In Vermont that would be very doable. I keep finding myself wanting to wear Gardener’s Glove when I’m not wearing it. I also wore Frost later last night, it was very warm and humid. It was PERFECT. The honeysuckle, rose and elderflower were amped up. So, I looked it up and it’s inspired by “To Earthward” and apparently his summer home was not too far from where her farm is now. Anyway, I feel like fans of the SSS line will also enjoy St. Clair. I don’t know how to describe it but it’s like Laurie captured the natural beauty of Northern California and it’s like Diane did the same but with New England. Both women have their own style, but their inspirations aren’t too off from each other, just a different setting of rural, natural beauty in the US. I love buttermilk. I am sure many will find this gross but I drink it daily (the cultures make me feel good). Usually plain but sometimes I do a thing with frozen peaches and a little bit of green cardamom. But most times plain or with black pepper and some chives (or mint). I make my biscuits and cornbread with it, etc. But, it is not easy to find here and when you do, it’s basically like water because all you can buy is non-fat (WHY?). Exactly what you said, thin and pale. I visited a friend in Chicago a few years ago and it was a reminder that you can still find good buttermilk at stores in the US…just not where I live (I guess the 2nd and 3rd generation Eastern Europeans here don’t drink it?). I’m sure this special stuff is expensive but I miss stuff that isn’t water. I just want to taste it again! Ok, your review reminded me how good these sound and prompted me to finally order the sample pack. I can’t wait to try them. People on NST have been saying good things about the line for a little while. Yay! I like the line. It reminds me of Sonoma Scent Studio, which I love too. In this move, I had the samples out to finish and also because I’ve been craving Gardener’s Glove. AND now I can’t find them. I’m going to be sad if I lost them (especially over 100 samples of Flowerbomb, lol).